Mars Orbiter Camera Views the "Face on Mars"
See also MOC and Viking Histograms and Why is the image of Cydonia only 1024 pixels wide? The picture was acquired 375 seconds after the spacecraft's 220th close approach to Mars. At that time, the "Face", located at approximately 40.8° N, 9.6° W, was 275 miles (444 km) from the spacecraft. The "morning" sun was 25° above the horizon. The picture has a resolution of 14.1 feet (4.3 meters) per pixel, making it ten times higher resolution than the best previous image of the feature, which was taken by the Viking Mission in the mid-1970's. The full image covers an area 2.7 miles (4.4 km) wide and 25.7 miles (41.5 km) long. Winter clouds cover much of the northern hemisphere of Mars above 40° N latitude at this time of the martian year. An image of the Viking Lander 2 site (at 44° N) taken just over a day ago was completely obscured by clouds. The image below shows a color composite made from the red and blue wide angle cameras (the green component is synthesized from the average of the red and blue frames). 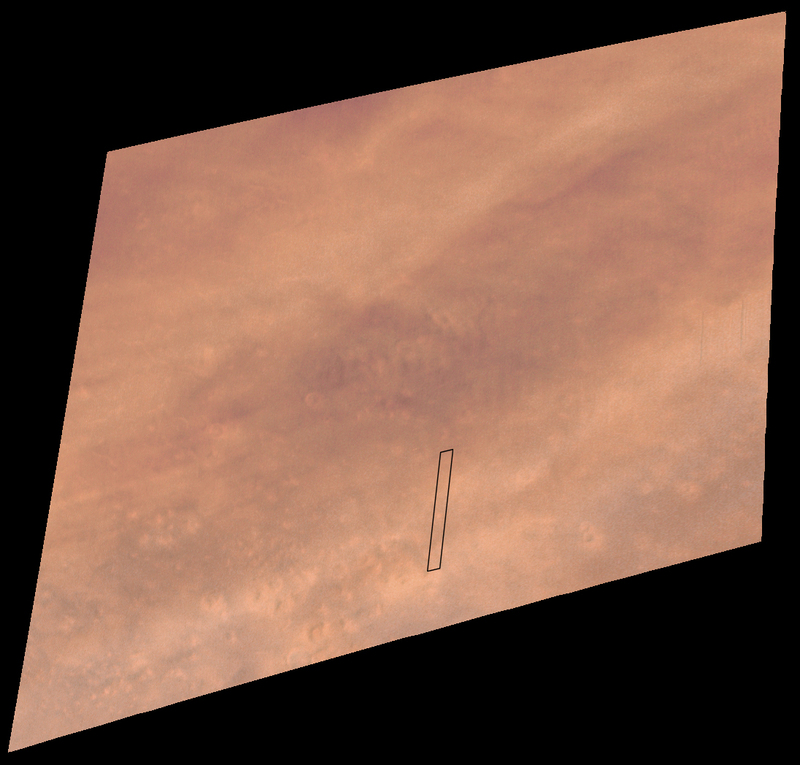 The small box marks the location of the high resolution image. As can be seen, fortuitously, the area imaged was relatively clear, although the lack of surface definition in many nearby areas, and the low contrast of the raw MOC high resolution image, suggests haze or fog over much of the area. The first two images below this paragraph are the best Viking pictures of the area in Cydonia where the "Face" is located. For more information about the "Face" and the Viking images, see http://www.msss.com/education/facepage/face.html. Marked on the two images is the "footprint" of the high resolution (narrow angle) camera. Also marked on the second of the images is a dashed box outlining the area seen in enlarged views. The third view is a one-quarter scale version of the full MOC image, presented to show the "Face" in relation to the features in its immediate vicinity. This image has been processed to enhance features and project it into a mercator map perspective. The images below this paragraph are portions of the raw image, and a slightly contrast enhanced version of the raw image, that include the "Face." The full raw image can be retrieved from the JPL WWW site by selecting either the MGS icon (the upper right of the four icons shown on that page) or by going to one of the many JPL Mars mirror sites. NOTE: The raw images shown immediately below (and on the JPL site) are flipped left to right from the others shown on this page because of the scan direction of the camera. All other images shown have had their orientation corrected for this scan relationship. The image was processed to remove the sensitivity differences between adjacent picture elements. This removes the vertical streaking. A section of the image, containing the "Face" and a couple of nearly impact craters and hills, was "cut" out of the full image and reproduced separately, as seen below. In the comparison below, the best Viking image has been enlarged to 3.3 times its original resolution, and the MOC image has been decreased by a similar 3.3 times, creating images of roughly the same size. In addition, the MOC images have been geometrically transformed to a more overhead projection (different from the mercator map projection of the preceding images) for ease of comparison with the Viking image. The left image is a portion of Viking Orbiter 1 frame 070A13, the middle image is a portion of MOC frame 22003 shown normally, and the right image is the same MOC frame but with the contrast reversed (that is, light features were forced to be dark, and dark features were forced to be light) to simulate the approximate lighting conditions of the Viking image.